Okwui Enwezor explains about “All the World’s Futures”. The 56th International Art Exhibition will form a unitary itinerary that starts at the Central Pavilion (Giardini) and continues at the Arsenale, with over 136 artists from 53 countries, of whom 89 will be showing here for the first time. “Olaf Nicolai is developing a new performance work that draws inspiration from Luigi Nono’s two-part composition Un volto, e del mare / Non consumiamo Marx (1968), an innovative piece for voice and magnetic tape, as well as the Italian composer’s later attempts to develop a critical and political statement by means of music, drawing inspiration for his lyrics from Cesare Pavese’s poems, from wall writings seen in the streets of Paris, and even found voices which he randomly recorded live during street demonstrations! Joana Hadjithomas and Khalil Joreige will present a daily reading of their artist book Latent Images: Diary of a Photographer, the third part of their Wonder Beirut project. In addition to its text, this book includes thirty-eight photographic plates selected from among hundreds of reels of film exposed, but until now never developed, by the Lebanese photographer Abdallah Farah between 1997 and 2006. Jason Moran’s STAGED will map and investigate the tempos of work songs sung in prisons, fields, and houses. In a sampling of songs that inmates sing while working in the Louisiana State Penitentiary at Angola, the tempos range from 57 to 190 beats per minute. Jeremy Deller will explore the question of life and working conditions in factories, based on archival materials from the nineteenth century through the present. Charles Gaines’s new original master composition for the Art Biennale is derived from his most recent body of work, Notes on Social Justice, a series of large-scale drawings of musical scores from songs, some borrowed from as early as the American Civil War (1860–1865) and others dating from the mid twentieth century. Mathieu Kleyebe Abonnenc will present in the Art Biennale a temporary memorial to the music and personality of the legendary African American musician, singer, and composer Julius Eastman (1940–1990), whose singular and inimitable contribution to contemporary, avant-garde classical music will be on display in the ARENA throughout the Exhibition. “The Invisible Borders Trans-African Project, for example, is an artist-led organization founded in Nigeria in 2009 that assembles African artists –mainly photographers, writers, and filmmakers- with the zeal and passion for social change, to reflect upon with the question of borders and its implications in 21st century Africa. The Invisible Borders will present in the 56th Art Biennale a Trans-African Worldspace, a survey of their platform’s recent and ongoing photographic and audiovisual production, which will be periodically generated and incorporated into their presentation throughout the seven months of the exhibition. Moreover, the group will present in the ARENA their feature length documentary Invisible Borders 2011, The Film, followed by a discussion on the State of Things in the trans-African contemporary art scene and the critical ideas at the center of their practice. The Biennale Sessions project will be held for the sixth consecutive year, following the success of its previous editions. This initiative is dedicated by la Biennale di Venezia to universities and academies of fine arts, and to institutions that develop research and training in the arts and in related fields. The goal is to offer favourable conditions for students and teachers to organize three-day group visits for fifty people or more, offering reduced price meals, assistance in organizing their journey and stay, and the possibility to organize seminars at the Exhibition’s venues free of charge. Educational activities will again be offered for the year 2015, addressed to individuals and groups of students of all levels and grades, to universities and academies of fine arts, and to professionals, companies, experts, art lovers and families. These initiatives aim to actively involve participants in both Guided Tours and Creative Workshops. To conceive and organize the choreography of the Exhibition spaces, the exhibition architecture, is designed by David Adjaye and members of Adjaye Associates. The Catalogue of the Biennale Arte 2015 is published in two volumes. The first describes the International Exhibition in a lengthy essay by the curator, divided into chapters that feature the narrative biographies of the invited Artists and the images of their works. Volume two is dedicated to the National Participations and the Collateral Events. The short guide is an essential tool for visiting the Exhibition: it contains information on all the Artists, the National Pavilions and Collateral Events. The graphic design of the Exhibition and its editorial products are by Chris Rehberger and his Double Standards studio in Berlin. Both the exhibition catalogue and short guide are published by Marsilio Editori. 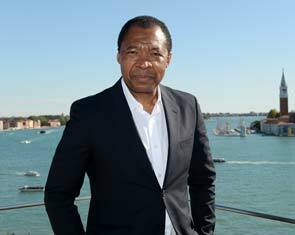 Image: Okwui Enwezor. Photo Courtesy La Biennale di Venezia.